Jumpmasters OBX offers more than just a great place to host your next birthday party on the Outer Banks. You and your crew can reserve one of our party rooms, perfect for decorating. Halloween may only happen once a year, but you can surely celebrate year round with these spooky yet fun Halloween themes for birthday parties! From a classic Hallowwen bash to a Fangtastic Vampire party, all of these themes entail creative costumes, dangerously delicious treats and festive decorating! Be sure that the costumes can be easily removed when jumping! Ahoy Mateys! Let the ship mates grab their pirate hats and eye patch, then enjoy some shark bait goldfish, peg leg corn dogs and pirate punch! From ghosts and ghouls, the ideas are endless! Decorate the party with spiderwebs, cauldrons and don't forget the candy corn punch! Welcome little monsters! 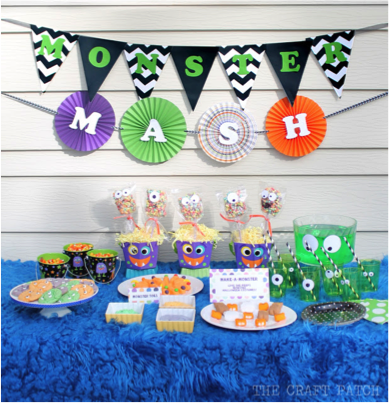 The Monster Mash is a colorful, monster-inspired theme the young kids will love. Have all the guests dress up in their favorite monster costume and pin the eye on the monster! Fangs, fake blood, bats and spooky treats. On the menu, Vampire Punch (Sprite and Grenadine) and Fang Donuts! October birthday parties can be so much fun to decorate-and hosting your next birthday party will certainly make it a memorable one! Reserve your birthday party today.